DJI’s Phantom 3, is the flying machine of choice for pro videographers. 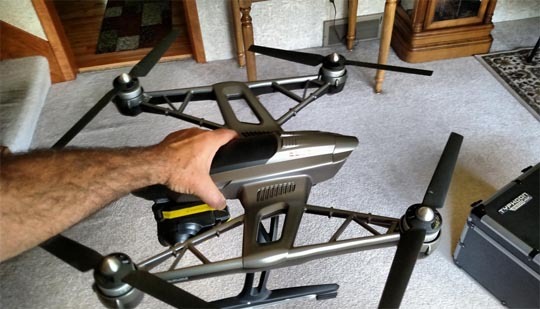 This Chinese-made Yuneec Typhoon Q500 is not as fast as the Phantom 3, but it is remarkably easy to pilot. There is no calibration necessary. You don’t have to download any apps. Read through the quick-start guide, set it in the middle of a field, and fly. You could be airborn in about two minutes. Unlike DJI’s quadcopters, the Typhoon’s controller has a built-in 5 inch screen with 480p resolution. There are fewer parts to keep track of, but you can’t add a larger screen. This controller reduces the learning curve a lot so it is easy for first-time pilots. The included app is intuitive. You may never need to read the manual. The touch screen is responsive which is good since some of the some of the buttons and menus are small. If you are looking for your first drone or want an easy to fly quadcopter with 4K camera, the Yuneec Typhoon Q500 would be a good choice.